In July 2015, Denver police shot and killed Paul Castaway, 35, who allegedly was charging them with a knife. In December of that same year, police in Chicago killed 19-year-old Quintonio LeGrier after he allegedly came at them with a baseball bat. In both of these cases, it was determined that the victims were experiencing a mental health crisis at the time they were shot and killed. In both cases, questions surrounding the officers' use of force have been raised. In fact, Castaway's mother had called 911 specifically asking for help with her mentally ill son. After the shooting, video surveillance showed Castaway was holding the knife to his own neck as he walked toward officers. Similarly, it was later reported that LeGrier had called 911 three times asking for the police department to help him because there was someone "in the house" who was "ruining his life." It was clear after the fact that he was in the midst of a mental health crisis and reaching out for help. Unfortunately, these are not isolated incidents. Stories like this have come from cities across the country. And it's frequently a similar scenario: A family member, a friend, or a bystander panicking at their inability to calm an individual in the midst of a mental health crisis calls the police for help, and it ends in violence. While there are a lot of grim tales, there is also change on the horizon. Amy Watson, PhD, an associate professor of social work at The University of Illinois at Chicago, has been carrying out a study funded by the National Institute of Mental Health that is examining the effectiveness of a police approach that uses Crisis Intervention Teams (CITs). The CIT Model, also known as the Memphis Model, is an innovative police-based first responder program designed to help law enforcement recognize and appropriately respond to a mental health crisis. Though it's suddenly receiving a lot of press, CIT is certainly nothing new. Watson points out that it was first developed in Memphis in the late 1980s after a man with schizophrenia was shot and killed by police. But after a continued rise in charges of police brutality and some highly publicized tragedies surrounding mental illness, there appears to be renewed interest. Concern has also arisen as funding for the mental health system has begun to "wither away," Watson adds. While there were formerly multiple agencies with multiple crisis teams, many agencies are now operating on "bare-bones budgets," Watson says. As a result, police officers are responding to numerous mental health calls and they need to be prepared to do so. Studies have found that CIT training can alter the way police officers view persons with mental illness—and that's of critical importance regarding the way in which they respond. The training teaches officers how to defuse a mental health crisis before force becomes necessary. While there is no accrediting agency for CIT, the original model most follow includes 40 hours of training with a national curriculum broken down based on various topics. CIT is a partnership-based model, something Laura Usher, coordinator of crisis intervention team training for the National Alliance on Mental Illness, says is really the foundation of its success. It is the partnerships between local law enforcement, mental health advocates, and others in the community that makes the program work. While it requires a commitment on the front end, Usher says law enforcement agencies recognize that it is saving them time in the long run. It's also making them safer because they're better prepared to handle these situations. Among the CIT training tactics are some techniques that might differ from the way officers are typically trained. Usher points out that generally officers are trained to be loud, to shout commands, and to repeat commands until a person complies. All of that boils down to being "intimidating," and while that might work on the average individual, it typically escalates the situation with someone experiencing a mental health crisis. "We know that people experiencing a mental health crisis are already in a state of stress and are likely having a hard time even hearing what you are saying to them," Usher says. "But they will hear the anger in your voice, even if they don't hear the command. They will see officers closing in on them. All of this is very frightening for a person experiencing a mental health crisis." It's important to recognize that while everyone can benefit from some basic mental health training, responding to these types of scenarios isn't the right "fit" for all officers, Watson adds. Part of the CIT model expresses that not everyone will be adept at this type of response, even after they've undergone the training. "Part of the program is identifying the people who have expressed an interest in responding to these types of calls," Watson explains. "That's not to say everyone shouldn't receive at least some basic skills such as what constitutes a mental health call and how they can manage that call until a CIT officer gets there." That basic training is what The National Council for Behavioral Health hopes to achieve with their One Mind Campaign. The National Council recently partnered with the International Association of Chiefs of Police in announcing their One Mind Campaign, which calls on all police agencies in the United States to train 100% of their sworn officers and other support staff in "Mental Health First Aid" and train at least 20% of sworn staff in the CIT model. Bryan V. Gibb, director of public education for the National Council for Behavioral Health, says more than 700,000 individuals have been trained to date and the goal is to make the training as common as CPR. It is an eight-hour, one-day course for law enforcement that includes the basic skills necessary to reach out and provide comfort for someone in a mental health crisis. Gibb says it's focused on deescalating a situation and then referring the individual to the proper channels for professional help. "It utilizes some very basic skills such as patience, a calm voice, and proximity," Gibb explains. "Individuals can be escalated simply because they feel trapped. And oftentimes, individuals may have a fear of the officer's uniform or of loud noises. Sometimes just understanding what these triggers are can help." Gibb says the foundational element of Mental Health First Aid is a background on what mental health "looks like." It teaches the officers about some of the common ways someone with mental illness might act. Then it looks at how officers can respond to those situations without escalating the situation. Finally, it takes a look at the stigmas that have been associated with mental illness—some of which may include preconceptions of the responding officers. "Stigmas reinforce and enable what officers think about individuals with mental illness and in turn affect how they'll respond," Gibb says. "But if we can get officers to understand what mental illness really is, it changes that response." Gibb says that when officers assume that a person in a mental health crisis is behaving in a certain way, perhaps like a criminal or a dangerous individual, those assumptions lead to a response. But Mental Health First Aid tries to create understanding. "If the individual is swinging their arms, an officer who comes from a place of understanding might recognize that this individual is not necessarily being aggressive but is being defensive," Gibb explains. "The officer will then understand that by stepping back, they may actually deescalate the situation." Undoubtedly, it contrasts with the basic training skills that most officers are taught. But that's why it's so important. Usher says that social workers can play a vital role in ensuring that someone who has suffered a mental health crisis is getting the services they need. Oftentimes these individuals are taken to the emergency department and released in 24 to 48 hours with no follow-up care—and that's when the cycle repeats itself. But an important part of the puzzle is ensuring that these individuals are connected to a long-term solution. 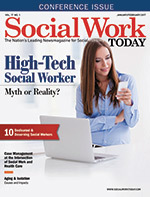 Watson says that social workers are often part of the initial training, as well. She says that when officers and mental health and community care providers, such as social workers, all work together, that's when true solutions are developed. "I would suggest that social workers get involved by going to their local precinct, attending roll calls, and just letting your local officers know what your agency does," Watson says. "As people begin to work together, that's what can lead to some real change in your community."